It’s the tail end of the prickly pear fruit season and I hope everyone has laid in their stock of fruit, frozen whole or made into juice. 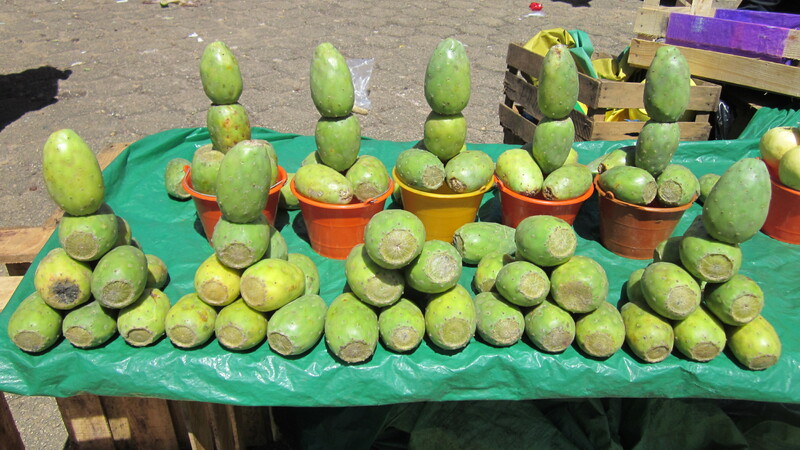 Prickly pears fruit (tunas) and pads (nopales) are still somewhat exotic in the United States although they have been eaten in the area by the native populations for thousands of years. In Mexico, however, they are a typical part of the diet, as normal as peaches and green beans are to those of us who live in the more northern areas of the Americas. The fruits in the photo above are not unripe, they are just a different variety of prickly pear from the bright magenta ones that grow wild in the western United States. The vendor has arranged them artfully to appeal to buyers. Options in a traditional Oaxaca cafe. 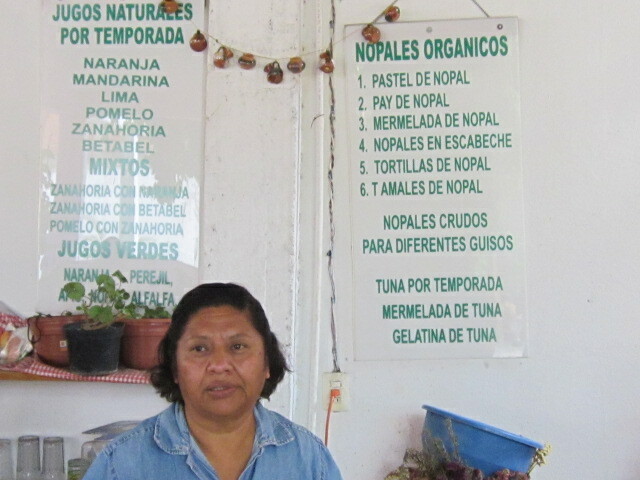 The menu above in a small Oaxaca City cafe shows the list of options with nopal that the cook is offering, from cake, to marmalade to tamales. 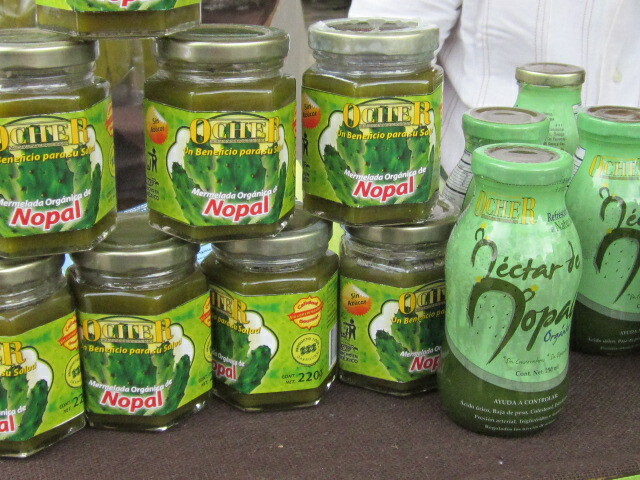 Prepared products with nopal on sale in Mexican market. Nopal is also used as medicine in Mexico. The health benefits of prickly pear pads have been known by practitioners of traditional medicine for generations, but recent medical research has shown that eating the pads or nopal actually lowers cholesterol and helps with diabetes. This has led to a slew of new products such as those seen above on display in an outdoor Mexican market. Some of these products are now available in the United States. 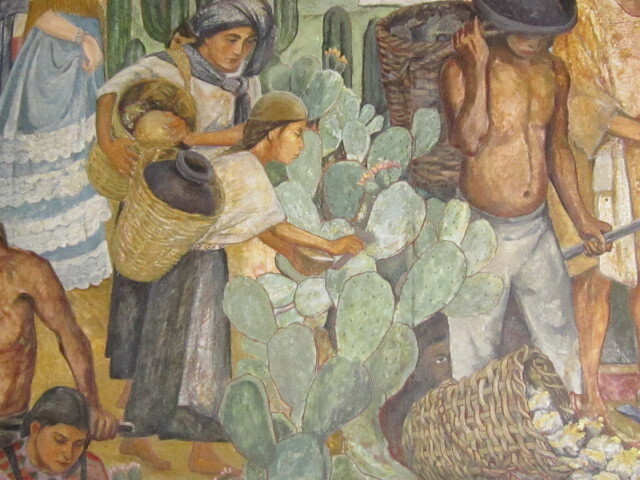 Oaxaca City fresco of woman gathering cochineal from nopal plant. Although Mexicans have relished the fruit and pads of the prickly pear plant throughout history, they also gathered the tiny cochineal beetles that eat the juice of the fruit. When crushed and properly prepared, the beetles can make a red dye that resists fading. The Spanish invaders were excited with this find as the Europeans at that time did not have a good red dye. Since red was the color of kings, it was important to have a good source. The photo above is a small section of a very large fresco in the municipal building on the zocolo in Oaxaca City. If you are looking for some good ideas with how to use your prickly pear juice (how many margaritas can you drink?) you’ll find some good recipes in my cookbooks: The Prickly Pear Cookbook, The New Southwest Cookbook, and Cooking the Wild Southwest. For some ideas of other plants you can gather watch the video trailer associated with Cooking the Wild Southwest.